Evergreen: Can "Anchor Institutions" Help Revitalize Declining Neighborhoods by Buying from Local Cooperatives? The Evergreen Cooperative Laundry is to be an employee ownership initiative nestled within a large and complex web of partnerships directed toward the goal of creating a new urban neighborhood in Cleveland out of several old ones. The laundry and its future sister enterprises constitute an economic initiative that will accompany a surge of investments in large public and private anchor institutions in the University Circle neighborhood.The Evergreen Laundry is to be the first of a network of new employee-owned enterprises that will employ neighborhood residents and stabilize the local economy. The Greater University Circle (GUC) project combines Cleveland's university campuses, cultural center and hospital district in the heart of the city with surrounding working-class and impoverished areas including parts of six neighborhoods in order to establish a safe, attractive, racially and economically diverse neighborhood without acute poverty, but also without throwing out or throwing away the people who live there now. It is a first of its kind initiative in urban revitalization, and the laundry is likewise to be the first of its kind - a new workers' cooperative with industrial scale capabilities capitalized with loans and grants from philanthropic and public investors. It is the first enterprise in a planned family of cooperative enterprises that will employ neighborhood residents in new "green" businesses notable for their energy efficiency or for the development and manufacture of green technology. The Cleveland Foundation took the lead in convening leaders and representatives from some 40 nonprofit institutions in the cultural center with city government, community development associations and other consultants, all brought together for the planning and creation of the new neighborhood. Other parts of the project include $2.5 billion in new construction and remodeling by the large, well-established anchor institutions (Case Western Reserve, Cleveland Clinic, University Hospitals, Cleveland Orchestra, Cleveland Art Museum), relocation and redesign of transportation hubs, new residential and retail facilities, three new high-performance high schools in an existing Board of Education landmark building, and a bold housing initiative to create new homeowners and renters. The economic inclusion element of the project was born with a question: why were so few benefits flowing from the anchor institutions to their surrounding neighborhoods? By the opening of the 21st century, the city's most successful institutions were the universities and hospitals that had been created out of a century of successful industrial enterprise in and around the city. Many of the steel, oil and chemical firms were now closed or relocated out of the city, but the nonprofit institutions their wealth had created remained behind, and these were remarkably successful nonprofit enterprises. They attracted students and clients from the entire nation. Hundreds of millions of dollars flowed through their treasuries every year. But very little of that flow benefited surrounding neighborhoods. In fact, some of the neighborhoods were so blighted that they represented an obstacle for people wanting to use the hospitals, attend the university, go to concerts or visit the Art Museum or Botanical Gardens. People at the Foundation saw that the neighborhoods should participate, needed to participate, in the anchor institutions' success. But how to do it? The Evergreen Laundry is a part of that story, as are its future sister cooperatives, for this is to be a family planned on a large scale. The Greater University Circle project had been underway for more than a year by the time the idea of developing cooperatives was raised. With the major plans for development and redevelopment of buildings and transportation already well underway, and a housing incentive scheme set to go, the Cleveland Foundation was looking for ways to reach out to the neighborhoods' residents with an approach that promised more visible success than efforts the city had made in the past. 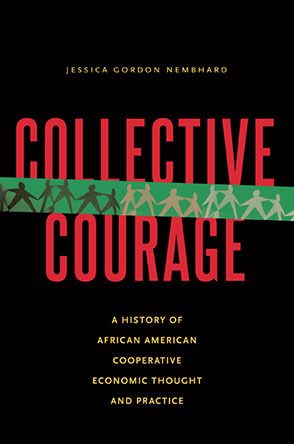 The idea of cooperatives and employee ownership was first raised in a community wealth-building roundtable in December 2006, sponsored by three philanthropic groups: the Cleveland Foundation, the Gund Foundation and the Sisters of Charity. They invited the Democracy Collaborative at the University of Maryland, a nonprofit group with a philosophic commitment to economic stability as the foundation of democracy, to organize the event. The roundtable offered leaders of institutions in the Greater University Circle a close look at a new capitalist strategy for creating economic stability and financial assets for poor and working people. The roundtable brought together representatives from the mayor's office, the Chamber of Commerce, the foundations, the six community development corporations operating in the GUC, the anchor institutions, several CEOs from employee-owned firms in or near Cleveland, the Ohio Employee Ownership Center at Kent State University, and a few outside consultants with hands-on experience. than their industry. Other research has shown that employee-owned companies are a little more profitable than comparable conventional companies. Companies that are wholly owned by their employees, like the cooperative laundry, also enjoy considerable tax advantages. The roundtable participants wrapped up by brainstorming next steps. That was followed by six months of interviewing by the Democracy Collaborative. Out of the roundtable and subsequent interviews grew both a strategy and awareness of business opportunities. The Cleveland Foundation's favored imagery for the strategy is a three-legged stool. The three legs of the strategy were local purchasing by the anchor institutions, getting local residents into owning the enterprises that employed them, and taking advantage of emerging business opportunities to produce in a more energy efficient, green economy. The laundry itself was conceived when William Montague, Executive Director of the Cleveland Veterans Administration Medical Center, pointed out that the VA would soon be needing a vendor of laundry services, because the current laundry facility in Brecksville would be closed when the VA's Brecksville center closed and operations were consolidated in Cleveland. Since the VA is a federal facility, the laundry service would be competitively bid, and there was no guarantee that any business from the GUC would get the contract, but a feasibility study by the Ohio Employee Ownership Center (OEOC) showed that the demand for laundry service was strong. The study revealed that although commercial laundries are known to pay low wages, in fact, they are profitable businesses whose earnings go to owners and shareholders, not the employees. Making the employees the owners meant that an employee-owned laundry could immediately provide jobs paying a little better and with better benefits than the going rate for such work and could also be a wealth-builder for employees over the years. To get the laundry up and running, the Ohio Employee Ownership Center provided from its staff Jim Anderson, a former CEO experienced with employee ownership and large-scale industrial processes. He took on the challenge of launching and leading the laundry in the crucial months of operation required to qualify for bidding on the federal contract. In the meantime, leaders of some private health care institutions in the area expressed an interest in patronizing the laundry. Anderson began by visiting the VA laundry in Brecksville. He saw the operation and learned that bidders for the federal contract at the VA must have demonstrated capacity and a business track record. That knowledge set the timetable for starting the Evergreen Cooperative Laundry. Anderson then visited other potential customers, including Cleveland Clinic (CC) and University Hospitals (UH). He found that both institutions are currently contracted - CC with Sodexo for about 10 more years, and UH with Paris Company. In his search for laundries to visit, Anderson came across M&L Supply in Akron. M&L sells commercial laundry equipment, and they opened the door for Anderson to visit a number of large and small facilities in Ohio. With CC and UH out of the immediate picture as customers, Anderson, with business consultant Stephen Kiel, began to develop a picture of the potential customer base in a 10-county area around GUC. They found 53 hospitals and 259 nursing homes washing an estimated 246 million pounds of laundry per year. Anderson, taking on the role of chief marketing officer, visited some of the nursing homes. He found that although most hospitals were already outsourcing their laundry, most nursing homes were not. He developed an educational marketing approach helping the nursing homes to understand what it cost to do their laundry in-house. "A typical reaction would be, 'Our costs are somewhere around 15 cents a pound,' and when we get done with a cost study, we find out that their costs are somewhere between 60 and 70 cents a pound, so they're off by a factor of four or five," reported Anderson. With his informational approach, he opened a door to a huge market. Nursing homes involved in the GUC project immediately expressed interest in becoming customers of the new "green" laundry. They could use their current laundry space for profitable activities and retrain and redeploy their laundry employees into better jobs in their growing business. It was a solution where everyone would benefit. "We can probably break even at 2 percent of the market, make money at 3 or 4 percent, and we're still a very small share of a growing market," observed Anderson. Kiel, who wrote the business plan for the laundry, observed, "The most important thing is that we're not looking to penetrate the market a great deal in order to reach our hurdle. We're building this facility to go to about 15 million pounds so the business plan calls for us to grow over a 10 year period of time to 10 million pounds We have the capacity to grow beyond that just by making minor investments in additional equipment. We've got the footprint and the capacity to do 15 million, but at 10 million pounds we're looking to penetrate 4% of the marketplace. We think that is a practical challenge and something that is achievable." The laundry will be launched as a cooperative. As a legal entity, a cooperative is a private company equally owned and democratically controlled by its members, in this case its employees. But the Laundry is a little unusual among worker-owned cooperatives. Cooperatives usually begin with a few workers pooling their work and their small personal funds to build up the enterprise. However, the laundry must have expensive machinery from the outset. It will receive a substantial capital investment from foundations and public investment to purchase its equipment and help from state and local government to train its employees. Management, provided by the OEOC, will hire employees from the neighborhoods who will then become co-op members after meeting the probationary period and applying to join. The membership fee will be paid through a wage check off. Anderson and Kiel planned for six months to launch the laundry -- two months to finalize and order equipment, two months to install the equipment, and two months of training for the employees. The equipment was ordered on July 2, 2008. But funding proved more difficult to obtain than anticipated, delaying the opening from late winter 2008 to late summer 2009. Modern commercial laundries are capital intensive, and lenders are always dubious of start-ups. In addition, the timing was bad: ECL's search for financing kicked into high gear about the time the 2008 banking crisis shut down lending. Putting the financing together took six months longer than expected and required Cleveland Foundation guarantees to First Merit, the local commercial lender which ultimately put in half the loan. Shorebank, which stepped in for the other half, got first position on the machinery and equipment, enhanced by the fact that it owns the real estate. Still, most of the financing came from the City of Cleveland, the Cleveland Foundation, and publicly subsidized New Market Tax Credits through US Bank. The financing could never have been put together without the commitment and support of the Cleveland Foundation. The laundry washing and drying equipment is made in the U.S., and is the very latest and most efficient. To reduce the energy needs of the laundry, heat from the used water will be recycled to heat clean water and the laundry will use the "greenest" chemicals acceptable to its customers. It will have skylights to take advantage of natural daylight, and plans to add rooftop solar panels in the future to further conserve gas and electricity. The laundry building is located in the Shore Bank Complex on 105th and Elk in the Glenville neighborhood, near the boundary of the GUC project. The neighborhood has been hard hit by economic reverses. The facility is on a bus line and there is nearby daycare for workers. The lead employees have been identified, and they are beginning to participate in the development of the laundry and its workforce. Anderson expects to hire the employees from the GUC neighborhood, including several veterans. He has identified and hired an experienced manager for the laundry and is currently looking for someone with experience in maintenance and a leader for operations to be the lead personnel for the new firm. The maintenance specialist is expected to visit the manufacturing plant and see how the machines are constructed. The maintenance specialist will receive training on operation, maintenance and repairs from the manufacturer. The leader of operations will learn to operate all the machines and train the other employees. Together, these three will train the other employees in the operations of the equipment in the laundry. Says Anderson, "The training is definitely connected to our whole business picture: We're going to have higher quality and lower costs because we're going to have significantly reduced turnover. If we begin to have a lot of turnover, we're not going to have the quality or lower costs, and this laundry is going to disappear. But being an employee owner, with your own vested account generating income and funds for you in the future, is going to provide some glue to keep you here in the company." Despite its annual goal of 5 million of pounds of laundry per year at startup expanding to perhaps 15 million pounds over 10 years, Evergreen Cooperative Laundry isn't expected to take anyone's job. Health care laundry is a growing business area, with nursing homes and hospitals flourishing and expanding to serve the growing number of retirees. However, the horizons for Evergreen are farther out than just creating a successful business. The laundry is expected to be just the first new employee owned enterprise in the GUC. Six or seven additional business opportunities have been identified selected for their feasibility. These include a solar panel installation and service company and an industrial scale greenhouse. Says Ted Howard of the Democracy Collaborative "What we are trying to create is a network of cooperatively owned enterprises. One of the things that we believe will help make that work is the Evergreen Cooperative Development Fund. It will be a nonprofit fund that will receive monies, certain kinds of commercial loans, grant monies and so forth, and we'll use them to help seed the creation of new cooperative businesses in this area. It will be a kind of venture capital effort targeted specifically at cooperative development, and the incorporation papers and bylaws of each new cooperative firm will designate that a percentage of profits will go into the cooperative development fund, once the firm is profitable." The Evergreen Cooperative Development Fund (ECD) for creating more cooperative enterprises will be launched along with the Laundry. After repaying its startup debts to commercial banks and the ECDF, each successful new business will contribute a portion of its profits to the Fund. It is recognized that not every new business can succeed, even with all the help in the world. Having a variety of enterprises going at one time will spread the risks of failure and increase the probability that some will succeed. And if just some succeed, they can grow and expand to employ more neighborhood residents. Photos courtesy of the Ohio Employee Ownership Center. This article originially appeared in OWNERS AT WORK, the magazine of the Ohio Employee Ownership Center, Volume XXI No. 1 Summer 2009. Evergreen Cooperative Laundry Manager: "Owning Your Own Job Is A Beautiful Thing."